Through our research, scholarship, teaching and service, we make pioneering discoveries, advance real-world applications of chemistry, and train the next generation of scientists. We hope you'll join us! Chemistry is the basic science that deals with the composition and transformation of matter, often involving hands-on or computational experiments to understand and control matter at the molecular level. 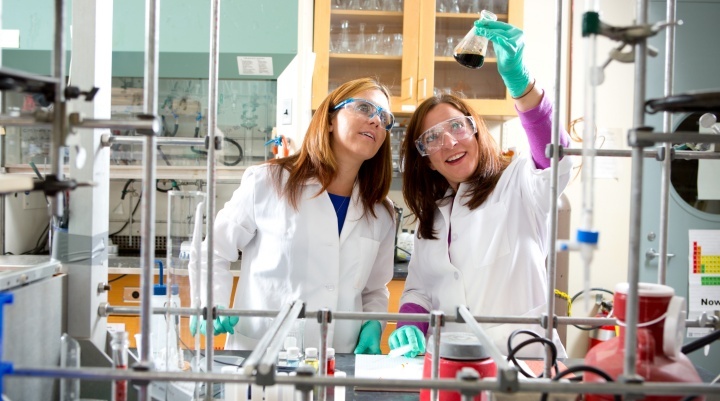 Chemistry careers include teaching, conducting research in industry and government labs, working with local, state and federal agencies, and more! We value quality and integrity in education, mentoring and research excellence while promoting diversity and inclusion. Research Interests: Bio-inspired molecular approaches to challenges in solar fuels; Synthetic inorganic and organometallic chemistry; Spectroscopic characterization of molecular compounds; Demonstrating applicability to solar fuels with electrocatalysis. Research Interests: Physical, materials and analytical chemistry: Nonlinear spectroscopy of interfaces, ultrafast processes at surfaces, molecular devices, biointerfaces and environmental surface chemistry. Research Interests: Mass spectrometry: Low-flow electrospray ionization, biomarker identification, metabolomics, proteomics, molecular imaging mass spectrometry, tandem mass spectrometry. Research Interests: Organometallic chemistry, medicinal chemistry: New reaction development with earth-abundant copper and manganese catalysts, asymmetric catalysis, alkene difunctionalization reactions, natural product synthesis, synthesis and medicinal chemistry of nitrogen heterocycles. Research Interests: Analytical, materials and physical chemistry: Chemical sensor and nanosensors, antifouling/fouling release materials, benign chemistry, wound restitution, corneal surface chemistry. Research Interests: Theoretical and computational chemistry; Quantum and classical molecular dynamics, nonadiabatic dynamics, computations in large-scale systems, semiempirical methods; electron-nuclear coupling, simulation of spin, charge, and excitation energy transfer; Solar energy conversion materials, nanomaterials and nanoscale systems. Area of Instruction: Instruction of undergraduate students in organic chemistry as well as the overview of general, organic and biological chemistry for students interested in health-science careers such as nursing. Research Interests: Self-assembly and characterization of discrete inorganic metallacycles and cages; energy harvesting, transport and storage in photo- and redox-active molecular materials. Polynuclear catalysts for small molecule activations of relevance to renewable energy schemes. Research Interests: Inorganic, materials, and physical chemistry: Synthesis and surface-functionalization of materials, assembly of nanostructured interfaces, spectroscopic characterization of photoinduced electron transfer. Research Interests: Nuclear magnetic resonance (NMR)-based structural biology, structural genomics and metabonomics: NMR methodology development, applications to study protein structure, dynamics and folding, metabolic profiling. Research Interests: Environmental and Analytical Chemistry: Fate and transport of emerging contaminants and endocrine disrupting chemicals; treatment of pharmaceuticals and personal care products in wastewater; environmental impacts of engineered nanomaterials; bioaccumulation of brominated flame retardants. Research Interests Polymer and organic materials chemistry: synthesis of advanced polymer structures, self-assembly and nanomaterial fabrication for biological and electronic applications. "My research in the Wood lab focuses on the utilization of high resolution mass spectrometry to investigate small molecules in their roles in disease states. Although the majority of my work focuses in metabolomics, investigating stercobilin as a putative biomarker for autism, I have recently started work in the fields of lipidomics and proteomics." "My research focus is on integrating theory and experiment to the design, synthesis, and characterization of semiconductor heterostructures with programmable light harvesting and charge transfer for photocatalysis." 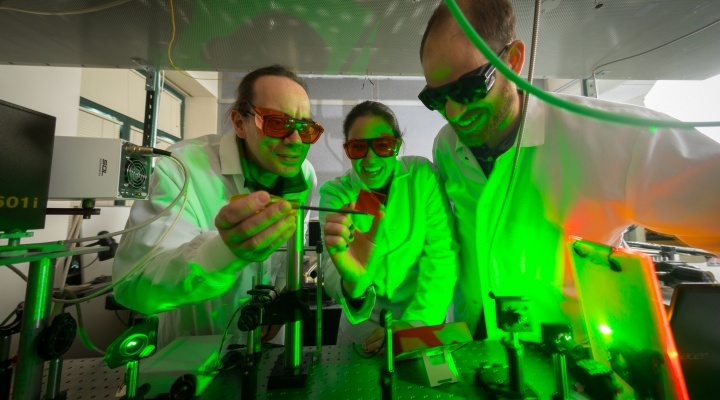 "My research focuses on the fundamental photophysics of multi-chromophore systems attained using coordination-driven self-assembly, focusing on transition metal chromophores as structural elements of the assembly. By using these supramolecular metallocycles and cages, we can manipulate photophysical properties by the introduction of multiple, communicative excited states as well as changing both radiative and non-radiative rate constants." "My research is on the functional characterization of lipids during apoptosis. I am particularly interested in how lipid droplet and its lipid components, such as triacylglycerols, are involved in this process." "My research in Prof. Eva Zurek’s group mainly focuses on predicting the structures of materials at high pressures using the open-source evolutionary algorithm XTALOPT coupled with density functional theory (DFT) calculations. My interests include superconductors, photovoltaic materials, as well as compounds of geologic relevance." "My research focuses on the synthesis and reactivity of novel organometallic and inorganic compounds with manganese metal centers." "Understanding the self-assembly of surfactants on the surface of single wall carbon nanotubes using an interfacial sensitive technique Sum frequency generation (SFG), by studying the effects of the nanotube’s diameter, surfactant concentration (SDS) and the counterions (Na+, Ca+2)." "My research revolves around exploring the host-guest chemistry of supramolecular coordination compounds." "My research goals include studying the mechanism and rationally design an inhibitor for an enzyme that confers pathogenicity to Mycobacterium tuberculosis." "As a N.Y. Sea Grant Scholar, my current research uses liquid chromatography tandem mass spectrometry to investigate the removal efficiency of conventional and advanced wastewater treatment systems for a variety of pharmaceuticals." "We have developed a methodology for treating quantum nuclear effects within the framework of classical mechanics which allows for their inclusion in molecular dynamics simulations at a fraction of the cost." "My research focuses on understanding the roles of specific lipids during necroptosis, a unique type of programmed cell death which has been associated with pathologies including neurodegenerative diseases, ischaemia-reperfusion injuries, and cancer." "My thesis research project focuses on developing new charge carriers for redox flow batteries (RFBs) using molecular-level design principles guided by electrochemical analysis to address stability, solubility and energy density." "My research focuses on exploring oxygen as a reagent and/or oxidant for copper-catalyzed reactions that are useful for the synthesis of nitrogen and oxygen based heterocycles." "My graduate research is primarily focused on the synthesis of reactive bottlebrush copolymers and their use in forming macromolecular architectures such as star-brush polymers, network structures, hydrogels, and nanogels." "My research interest is on the impact of nanoparticles on plant systems and cell lines. I look for metabolomic changes in these systems using liquid chromatography with quadrupole time-of-flight mass spectrometry." "My research focuses on developing organomanganese catalysts for photochemical water splitting. Our long-term goal is to achieve photocatalytic conversion of water to H2 and O2 using earth-abundant single-site organometallic complexes." Alex’s research focuses on understanding the influence of solvent such as water on the structural and nuclear magnetic resonance properties of heavy element complexes. "My research focuses on an alkene difunctionalization reaction using a copper(II) salt as an earth abundant and relatively less toxic metal catalyst." "My project focuses on self-assembled cofacial catalysts for the oxygen reduction reaction." "The research I do focuses on the synthesis and analysis of paramagnetic transition metal complexes made of macrocyclic ligands with pendent arm to coordinate to the metal ion." "My research is focused on better understanding the chemistry involved in molecules being adsorbed to metallic surfaces and what properties exhibited by such systems are useful." "My research focuses on the development and evaluation of new stationary phases for liquid and supercritical fluid chromatography." "My research focuses on the functional involvement of lipids in different cellular processes, including senescence, using global LC-MS-based lipidomics." "My research focuses on designing modified microarrays on porous silicon platforms which can be used for a host of applications including lab-on-chip devices and label-free multi-analyte chemical sensors." "My research focuses on the synthesis and mechanistic investigation of methylene-free enyne metathesis." "I study photo-induced electron transfer in covalently linked quantum dots donor – metal oxide acceptor assemblies relevant to solar energy conversion by using steady state and time resolved emission spectroscopy." "My research is focused on using liquid chromatography mass spectrometry to analyze the metabolites produced by a non-model green microalgae, Ettlia oleoabundans." "My research is focused on the development of antifouling and fouling-release hull coatings for the United States Navy." "The core of my research is to develop novel copper-catalyzed oxidation of potassium alkyl trifluoroborate salt to generate radical, which is used to functionalize alkenes." "My research involved designing photo-responsive multi-analyte chemical sensors on porous silicon platforms through surface functionalization and various printing methods." "My research deals with the synthesis of linear block copolymers that self-assemble to form ordered periodic nanostructures." "Our goal is to synthesize red-shifted azobenzene amino acids that can be incorporated into protein using amber codon suppression technique, with the aim of achieving spatiotemporal control using visible light." "My research is focused on preparation and separation of carbon nanomaterial by high performance liquid chromatography (HPLC) and the development of novel diamond-based stationary phases for separation science." Josh uses mass spectrometry and surface analytical techniques as a method for investigating environmental issues of salient public concern. "As a member of the Benedict Lab I am designing and synthesizing photochromic metal-organic frameworks." 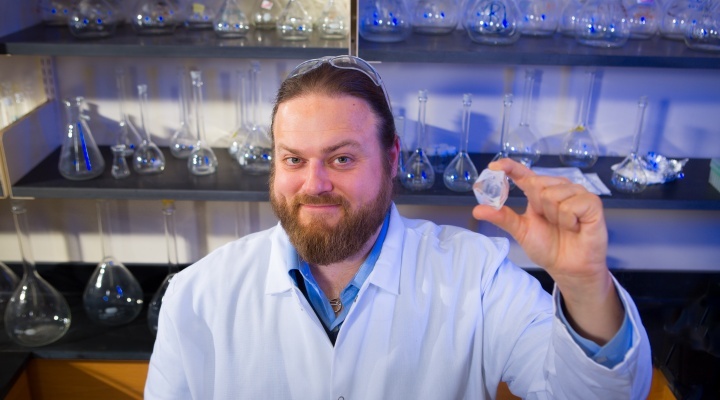 "The research that I do in the Zurek lab comprises the use of evolutionary algorithms and Density Functional Theory to find stable crystal structures at extreme pressures." "I am working on a project to optimize the properties of anti-cancer drug candidates." "The main focus of my research was to develop very unique Zn(II)-macrocyclic complexes for the recognition of thymine in non-canonical DNA secondary structures, such as G-quadruplexes and bulges." "My research focuses on the synthesis of colloidal quantum dots and surface functionalization to build quantum dot-molecule-semiconductor interfaces that promote photoinduced charge-transfer." "The primary goal of my research is to study various properties of functional materials by colocalized Raman and atomic force microscopy." "My research primarily focused on the synthesis of chalcogenopyrylium dyes that display a high affinity for the surface of gold nanoparticles." "I’m currently studying the diffusion of flame retardants in polymeric fabrics using the TOF-SIMs." "My research project focused on the investigation of the function of a nonreacting phosphate group in enzymatic catalysis using diverse experimental methods such as organic synthesis, kinetic isotope effect measurements and protein X-ray crystallography." "My research focuses on the analysis and determination of estrogens and their transformation products in environmental matrices such as animal waste, wastewater and surface water." "I really enjoy the atmosphere of the graduate program at UB, the sense of camaraderie and that everyone is working for the common goal of furthering scientific knowledge."